This morning, I watched my new nephew for a few hours. I’m not going to lie- he kept me busy. I’m not very good at multitasking while holding a newborn. It’s 10:47 AM and I’m still in my pajamas and haven’t achieved anything yet. But look at those tiny toes. Can we precious? Tiny toes, and baby powder. He’s the best, I shout louder. Just a munchkin, sleeps alot. Love for him, can’t be bought. Teensie smile, just for me. It’s ok, just had to pee. Uh Oh, he’s bearing down. Little face a nasty frown. I gotta go, call his Mama. Cuz, I don’t do, poopy drama. Marla, You should keep this post and that little ditty, and when he’s about 13 or 14 and he and his buds are over at Aunt Marla’s, bust this post out and watch him turn red. My aunts woulda done it. Awwwwwwwwwwwwwwwww. Precious baby. I love days when I can stay in my pj’s all day : ) Those are the best kind! 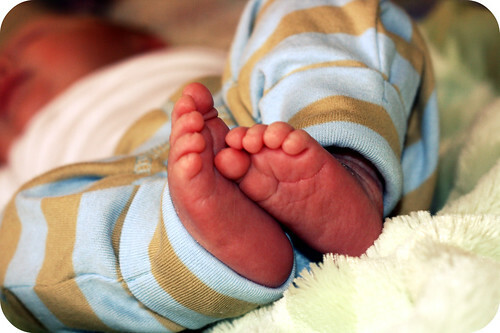 Awwww… I LOVE baby toes. Too sweet. And yeah, multi-tasking. It’s quite the challenge to accomplish anything much with a little one. They’re small, boy, but they have HUGE demands and needs. This is why they have cute toes, see: so when you’re dying for a coffee or to brush your teeth or take a pee and you CAN’T, you see the toes. And all is forgiven.